Tonight, Kirk Kaczor’s Wildcats crushed the East Hampton Bellringers away 67-40. Junior Aiden Using, pictured above, led all scorers with a powerful 19 points while Connor Hogan contributed 13 vital points and eight rebounds. Brady Sheffield notched 11 points along with eight steals and completing the tally of double-digit scoring was Jared Richie with 10 points. Old Lyme is now 11-1 overall and 11-0 in the Shoreline. 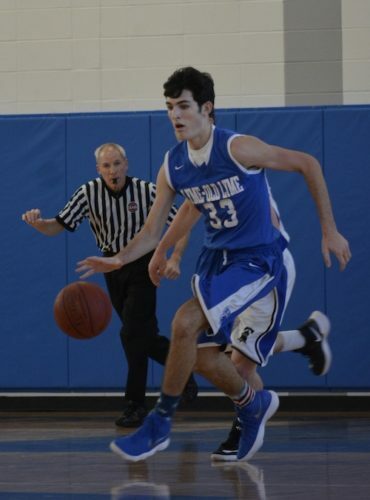 Last Tuesday, Old Lyme soundly defeated Coginchaug 63-44. Employing the defensive tenacity of a five-person guard rotation comprising Brady Sheffield, Ray Doll, Connor Hogan, Quinn Romeo, and Liam Holloway, the Wildcats took control of the game at an early stage. Brady, Jared Ritchie and Aedan Using combined to score a remarkable 47 points.